The TIDDOX MICROFIBRE LENS CLOTH is specifically designed for use on delicate equipment and other sensitive surfaces such as glass, monitors, jewelry or wiping tasks where a soft, non-abrasive cloth is required. 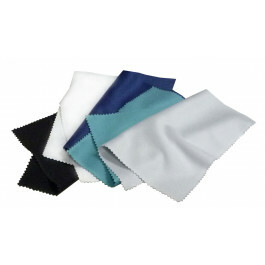 Microfiber is very absorbent and soft, so it’s a great choice for industry applications where a delicate, soft and absorbent surface cloth is needed. Being made of strong knit microfibre these cleaning towels are low lint, so they are perfect for polishing surfaces with fine tolerances for excess lint remnants. These microfibre cleaning towels have a non-abrasive texture, but are strong enough to be used for scrubbing. The absorbency makes them a good choice when you are using cleaning solvents or soaps and enables the cloth to dry a surface quickly. It will also absorb dirt, dust, and grime, making it a great choice for carpenters who need to refinish furniture in a dust-free environment. These microfiber lens cloths are available in large size at 40cm X 40cm or small sized 15cm X 15cm. People who work with delicate instruments or small items such as gemstones find that the smaller towels are more practical. They are available in 5 colorus: green, white, black, navy, and gray. Your order will have 100 cloths in each carton. Machinery used in many industrial scenarios will often have very fine tolerances. Cutting surfaces must be kept free of debris and lenses, mirrors, and glass must remain clear and non-occluded. TIDDOX's INDUSTRIAL MICROFIBRE LENS CLOTHS are designed specifically for this kind of work. While your car care towels may do the lion’s share of the work in your car detailing business, there are times when you will need a smaller, more maneuverable CAR CARE TOWEL. Whilst a car may not have any finely honed lenses, it does have plenty of mirrors that benefit from the smaller sized microfibre lens cloth or the larger sized WINDSCREEN WIPING CLOTH. The automotive garage goes through bundles of recycled T-Shirt rags every day. Why not add a few of our specifically designed AUTOMOTIVE MICROFIBRE LENS CLOTHS to your stock pile to clean lathes and gauges that have very fine tolerances, giving you more accurate measurements? The medical profession works with many highly attuned pieces of equipment. Lenses and mirrors in and on medical tools often have to be cleaned to render accurate readings. Our MEDICAL MICROFIBRE LENS CLOTHS will clean without leaving lint behind. This cloth is very popular in vision centers because they can remove fingerprints and solvents from glasses being adjusted. The hospitality industry encounters shiny surfaces in housekeeping and in the kitchen. Our HOSPITALITY MICROFIBRE LENS CLOTH is just the thing for hotel house keeping to shine mirrors and windows or for restaurants and bars to to clean and polish silverware and drinking glasses. People involved in healthcare take care of children and in-home patients, where a clean and sanitised environment is paramount. Microfibre is a great material to sbaorb spills and pick up dirt, and the HEALTHCARE MICROFIBRE LENS CLOTH is a premium quality fabric ideal to clean windows , screens, ipads, and stainless steel surfaces in these types of hygienic environments. When comparing paint colors and analyzing hues for exact matches, painters often use a glass. Our PAINTERS MICROFIBRE LENS CLOTHS are perfect for removing smudges and dust in preparing surfaces for painting. Printers have a unique combination of massive machinery and tiny tolerance. Our PRINTERS MICROFIBRE LENS CLOTHS will keep surfaces clean and lint-free for crisp images.